During the early nineties I worked as an advisor for SCA Benelux and the Away from Home Division. My roots in the hospitality service industries and international experience were valuable for this job in which we did projects such as the center feed roll innovations for kitchen use and napkins. Hans Broekman was a key person and I advised him not to let go and dilute the TORK brand into a 'generic' brand which he appreciated very much. Now I see where the Tork brand is now, I am quite proud of what the team made of this strategic advice. 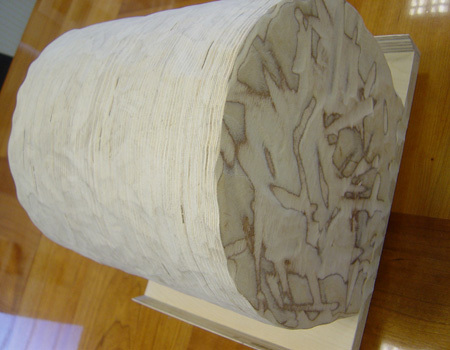 Disposable paper is made out of wood. In <?xml:namespace prefix = st1 ns = "urn:schemas-microsoft-com:office:smarttags" />Scandinavia 'forest management' is of a very high standard and environmental proof. 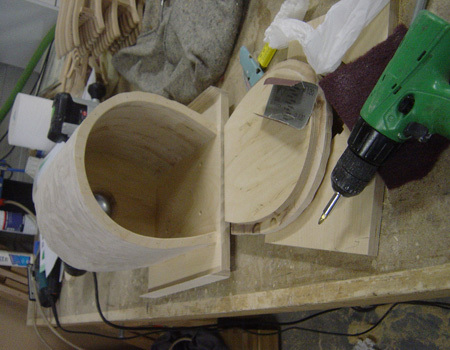 After my start at Ritmeester Ltd, specializing in wooden interiors I developed the idea of milling a wooden bath with a 5-axis CNC milling machine. For this project the well known Nordic company of Finnforest and it�s very dynamic and innovative managing director Ol�f van Woudenberg came to help. And a lot of other companies. I refer to the numerous items which were published about this Masterpiece in Wood. 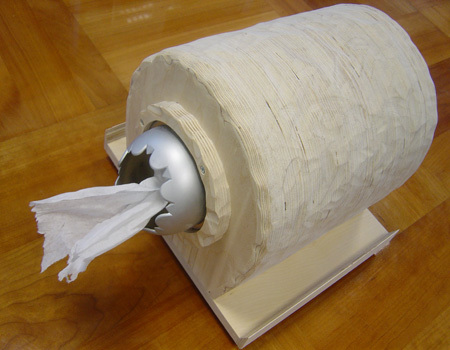 Center feed tissue rolls and birch plywood� Do you see the link? Coming from a traditional gastronomy family, I hate to throw away fresh food. When you service broccoli as a daily vegetable today (for instance) you can create a lovely broccoli soup tomorrow when there is a little fresh broccoli left in the refrigerator. The same idea I have with 'leftovers' of wood since the financial value of wood is even higher: we use expensive woods like teakwood, cherry and mahogany. 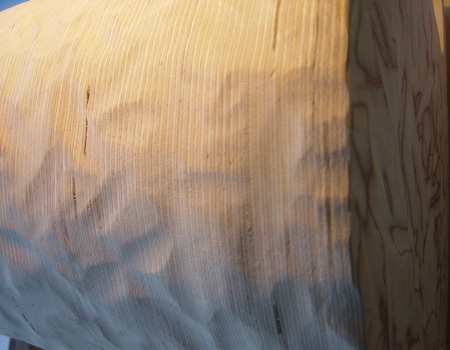 The link between Finnforest birch plywood and Tork Center Feed rolls. Now we have a plastic dispenser for the center feed Tork rolls in our sanitary rooms. It is clean and hygienic, I know. But I wanted to create a unique Masterpiece made of the same material as the paper that is in it. WOOD! And: made out of waste material from our CNC milled birds. So the challenge was on and I asked Geert Kooiman, trainee of the dutch www.hmcollege.nl to design his ideas around a dispenser. Since Ritmeester BV is specialist in rounded an bent forms, Geert made a number of sketches and designs of which the � later � so called Omega Dispenser immediately was my favourite. But not until we had discussed the texture of the outside. A few years earlier I had created the PAL CASE CONTEST (www.palcase.com) > examples. And the PAL BOX was and is still one of my very top favorite designs. The secret not only lies in the shape but also in the fact that ALL people who see it want to touch and feel it! This effect I would like to achieve as well with the surface of the OMEGA dispenser so I asked Geert to roughen it up. The effect is clear to see: the light plays with the different irregular surfaces and gives the dispenser a remarkable exterior. Like if it is cut out of wood. The dispenser has a unique surface, both the body and the lid. The mounting plate enables the dispenser to float before the wall and finishes the Omega-sign. It shows all of the characteristics of the beautiful finnish birch plywood. We at Ritmeester Ltd want to stimulate young students to test and train their creative capacities also. Not only producing but also creating; that�s the challenge. I am very satisfied about his work which I rated as a ten out of ten! 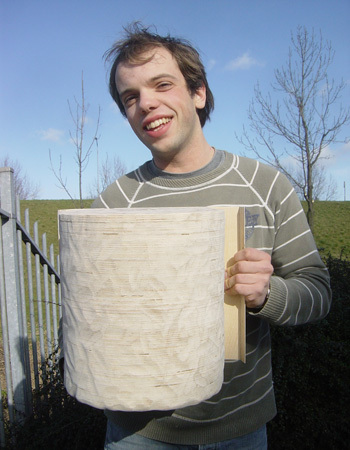 Now Geert Kooiman will be creating wooden dispensers and every one is a unique piece. So if you want to buy one: just give us a call. The finish can be either untreatd (natural); oiled, sprayed in satin or high gloss or in any other dress you wish! Prices upon request. You can order a unique Omega Dispenser (or ask 'Creative Geert' to design a different model if you wish) in birch plywood. Geert will be happy to realize a unique one-off for you which will be a Masterpiece in Wood and a jewel in you sanitary room or kitchen at home!